Does York University have any resources specifically for mature students? Will I be welcome at York as a mature student? Are there scholarships and bursaries available to mature students? What can ACMAPS do for me? It has been a long time since I've taken a class, and I am not sure I'm ready to jump into full-time university studies. Does York provide career support services for adult learners? What services are available to mature and part-time students after 4:30pm? What resources are available to help me build a flexible course timetable? Am I a mature student? There are many students at York University, undergraduate and graduate, who have embarked on their university education after several (or many!) years away from formal education. These students bring their experience, expertise and unique perspectives to the classroom and York community. Mature students come from a variety of backgrounds and each has their own unique reasons for beginning a university degree or returning to their studies.The ‘Mature Student’ is also a category used by the Office of Admissions in considering your application to York. If you have any questions about the category, you should visit York's Future Students web page or make an appointment with an admissions adviser. You will be considered for admission as a mature student if you are 20 years or older as of the first day of the session for which you have applied, and if you have been out of full time high school studies for at least two years. You can also apply as a mature student if you have previously attempted less than one full year of studies at an accredited university or college. A mature student has typically demonstrated potential for success at university level studies through academic, professional, volunteer activities or other accomplishments.Many older students are not admitted in the ‘mature student’ category, but come to university as transfer students or graduate students. The Atkinson Centre for Mature and Part-time Students is open to all students who feel that they will benefit from its services. Does York University have any resources specifically for mature students? In addition to the Faculty and University resources available to all students, York has several programs that serve the unique needs of the mature student body. The Atkinson Centre for Mature and Part-time Students was established in order to serve and study the needs of mature students at York. At the beginning of each term, ACMAPS presents an orientation for mature students which includes an introduction to the various university resources and a library orientation. Throughout the year, ACMAPS advisers are available to meet with students during centre office hours, including some early evening and Saturday hours. During the term, the Atkinson Centre offers events and programming that will support mature students in their academic journey from recruitment through to graduation. 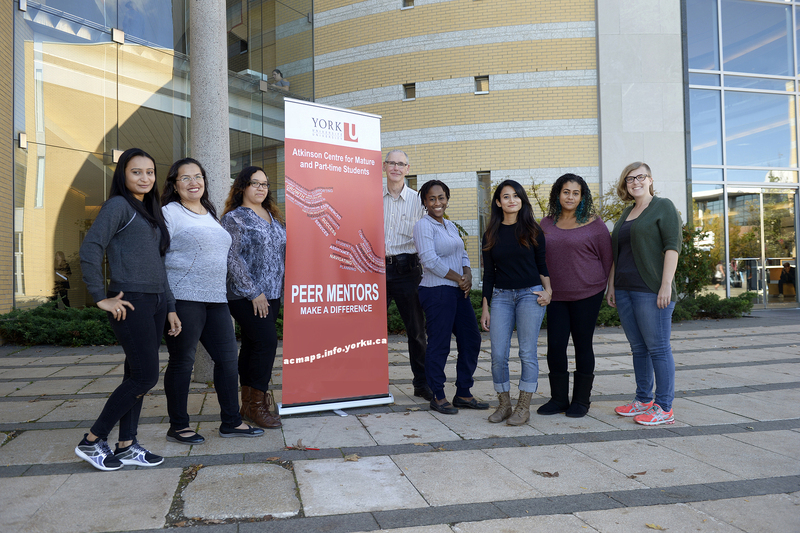 In addition to ACMAPS there is the York University Mature Student’s Organization (YUMSO), a student run group that offers the opportunity to connect to other mature students through social events, activities of interest to mature students, and networking opportunities. Visit their lounge in Vanier College 113B, or e-mail them for more information (yumso@yorku.ca). Will I be welcome at York as a mature student? York University is committed to welcoming and serving the needs of mature and part-time students across all the Faculties. ACMAPS encourages mature students to get involved and to take advantage of all the resources of the university. Welcome to York! Don’t hesitate to make ACMAPS part of your York experience. Are there scholarships and bursaries available to mature students? A number of scholarships, awards, and bursaries are available to York students. For information about these opportunities visit the Student Financial Services website. In addition to the opportunities available to all students, there are several scholarships reserved specifically for mature students, including entrance scholarships. In addition to searching for scholarships by faculty and field of study, you can search the scholarships, bursaries and awards search tool using the keyword “mature student.” Don’t be shy to apply! Many scholarships require an application, so do take the time to look at the available awards. The advisers in the ACMAPS office will be glad to talk to you about the application process, review applications with you, or help you navigate the resources. You are applying to York and want to know more about the university, discuss whether university studies are right for you, or get some feedback on your personal letter. You are a new student at York, and wish to participate in our Mature Student Orientation program held at the beginning of each fall term. You are getting settled in at York, and want to participate in special events or sessions aimed at mature and part-time students. ACMAPS organizes groups, presentations, and discussions where you can meet other mature students, and learn about topics of concern to you and your peers. You have ideas, concerns or questions related to your experience as a mature or part-time student at York. We are always glad to speak with students about how to improve the York experience and to work with you to build a community of mature students at York. You have questions, concerns or difficulties with any aspect of your studies and want to talk with an ACMAPS staff member about your current challenges. We are available to speak with you and help you find the resources you need to succeed. You are a student or faculty member interested in adult learning. ACMAPS is a resource for students and faculty interested in scholarship about adult learning and are currently engaged on research. It has been a long time since I’ve taken a class, and I’m not sure I’m ready to jump into full-time university studies. Many mature students return successfully to their studies after years (or even decades) away from school. We encourage all new mature students to take advantage of York’s orientation programs, academic support services, and the Atkinson Centre for Mature and Part-time Students as they make the transition into their first year of studies. It can take a while to adjust, but with the support of York’s academic support services and personal commitment mature students do succeed!If you feel you need to test the waters before returning, York offers several pre-university programs that might be for you. The School of Women’s Studies Bridging Program for Women and the pre-university Admission Credential Courses offered by the Atkinson Faculty of Liberal and Professional Studies are designed to help you to develop the skills and confidence that you need to continue your education. Please contact the individual programs for more information. Does York provide career support services for adult learners? The Career Centre, located in McLaughlin College (Suite 202), is open to all York students and provides support in the development of career self management skills. The Career Centre staff has a wide range of expertise for supporting you as you pursue your career goals, and can assist you with issues affecting mature students and mid-career job searches. Identify yourself as a mature student, and take full advantage of the life and work experience that sets you apart from your less experienced colleagues.The Career Centre offers ongoing sessions in their Making Career Decisions workshop series. We recommend the “Who am I?” workshop, an interactive self-discovery exercise that will help you gain insight into the things that are most important to you in the world of work. The Career Centre also offers workshops on everything from cover letter and resumé preparation to interviewing skills, as well as a resource centre and an on-line career cyber guide. You can also make a Job Search Advising appointment with a Job Search Advisor who will give you one-on-one support for your job search including feedback on your resumé or cover letter and help preparing for your next interview.For more information on all these programs, please see the Career Centre website. ACMAPS encourages mature students to take advantage of this campus resource. What services are available to mature and part-time students after 4:30pm? There are various services available after 4:30pm and on weekends to accommodate the needs of all students. Please view the attached YU Resources Link document for more details. Kindly note the hours of operation are subject to change each semester. We encourage you to contact individual units for further information.